After more digging and organizing, I found my order of My Ten Friends that I received a month ago. 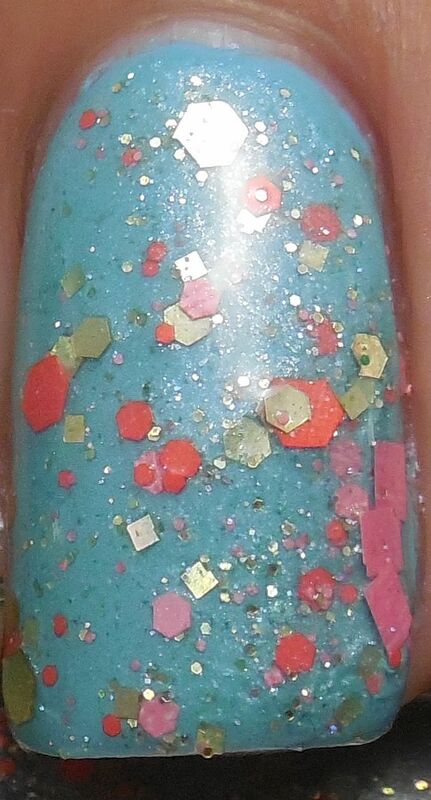 In this order is Lunar Love Song, a lovely teal blue jelly base glitter that has gold, orange, pink multi shape/sized glitter and golden shimmer. I love how the orange glitters pop against the base. I found the formula to be really sheer and packed with glitter. Application wise it was thick but workable. 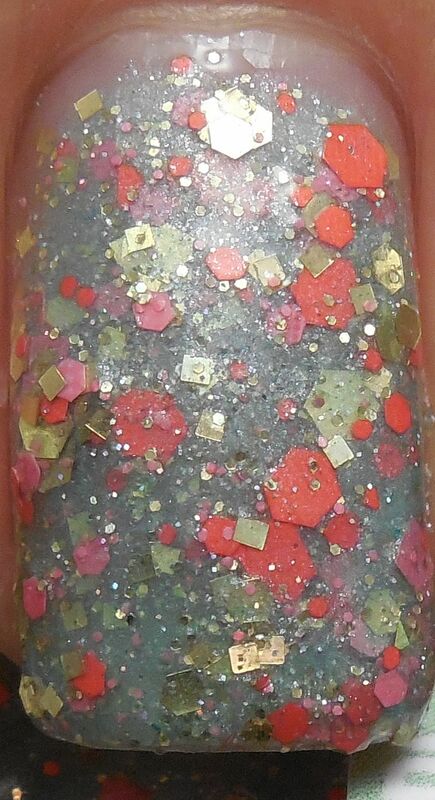 It becomes semi-opaque after three coats but is really full of glitter. I used a layer of Essence Gel Like Topcoat to finish it off. I wasn't happy with the base not showing through well, so I layered one coat over American Apparel The Valley, a bright sky blue cream. I think it looks much better this way because the glitters really contrast more against the blue. Which way do you prefer this? Have you ordered from My Ten Friends before? I had no idea it took a month for her to fulfill the order, not to mention it took me another month to figure out where I stashed it(remember I had guests in March?). Overall, I really like the mixture of glitter in this polish. This is so pretty! I've never ordered from the brand before but if I do, I'd definitely get this one. She has great combination of colors in her polishes. definitely worth checking out!